When making plans for that new kitchen, it’s important to think about how you’ll be using the space and where specific light sources will be needed. A well though out lighting plan has many layers to it. Let’s explore those layers to help you create a cohesive and functional kitchen. Recessed cans, chandeliers, wall sconces, flush mount fixtures, even natural light – ambient lighting is your foundation, a general “blanket” of light for your kitchen. It helps you navigate your space (without running into things), and it’s really the first step to your lighting plan, serving as the base for all other layers. Task lighting may arguably be the most important layer. It helps you complete specific jobs, like meal prep and cooking, in the kitchen. 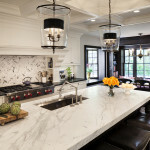 Under cabinet lights over the countertop, pendants above the island, lights at the range – it’s important to see what you’re doing especially when working with sharp knives and other potentially dangerous tools. Accent lighting sets the tone for your kitchen, creating a warm and inviting space. It’s often known as the decorative layer. It can also be considered task lighting, but it demands a bit more attention – in-cabinet lights to display dishes or collectibles, beautiful pendants, and other fixtures to highlight a unique aspect of the space. They round off the room to make it feel complete, and with so many options, it’s a great opportunity to really show off your personality. Throughout the day, your lighting needs change. During the day, natural light is often sufficient, but as the day progresses you’ll need help from your fixtures to illuminate the space for cooking and cleaning. Entertaining? You’ll want to set the mood. That’s where dimmers come into play. Dimmers can be incorporated into all layers of lighting, so you can adjust the light for your specific needs. For instance, they’re a great option at night or in the early morning when you’re not quite ready for bright lights. Now that you’re familiar with the various layers of light, it’s important to note that you don’t have to use separate fixtures for each layer. There’s often a lot of overlap. This entry was posted in Tips and tagged Accent Light, Accent Lighting, Accent Lights, Ambient Light, Ambient Lighting, Can Lighting, Can Lights, Chandelier, Decorative Light, Decorative Lighting, Decorative Lights, Delafield Remodeler, Flush Mount, Flushmount, Home Improvement, Island Lights, Island Pendants, Kitchen Design, Kitchen Lighting, Kitchen Lights, Kitchen Pendants, Kitchen Remodel, Lake Country Remodeler, Layers of Light, Layers of Lighting, Lighting, Lighting Design, Milwaukee Remodeler, Mood Light, Mood Lighting, Mood Lights, Natural Light, Pendant, Pendants, Recessed Lighting, Recessed Lights, Sconces, Southeastern Wisconsin Remodeler, Task Light, Task Lighting, Task Lights, Wall Lights, Waukesha Remodeler, Well Lit Kitchen, Wisconsin Remodeler on April 26, 2018 by amanda. Whether it’s a window seat, bookshelf, bed, or bar, built-ins lend character and function to a home. We love that they can be tailored to specific needs and that they offer a cohesive and seamless look. Built-ins are a great opportunity to take advantage of every nook and cranny and can really maximize your space! Let’s look at some examples. Window seats are versatile. Incorporate them into a dining room, office, bedroom, family room, or hallway. They are the perfect opportunity to make the most of otherwise wasted space and insert extra storage. Plus, who hasn’t dreamed of having a window seat? It’s a great place to curl up with a book or sip a cup of coffee. And it can be a beautiful way to frame a view. Built-in bookshelves are multi-purpose – a place to store items and a lovely way to display decor, books, and collectibles. They truly give a room a finished and sophisticated look. A built-in bed is ideal for kid or guest bedrooms! They can be tucked into an alcove or under a slanted wall. Let’s not forget to mention how cozy they are! Bonus – they can offer extra storage. Check out those built-in bookshelves and drawers! Like all built-ins, a built-in media wall subdues clutter and makes a space feel more substantial. It can also serve as the anchor of the room. This example mixes in shelves, reclaimed windows, and drawers to break up the size of the wall, add interest, and offer even more storage. Side note – the built-in cabinetry in the foreground of this photo was incorporated into the design to not only display the homeowners’ vintage treasures, but to also define two rooms while keeping them open to one another. A built-in wet bar often serves as the home’s entertaining hub. The great thing about a built-in wet bar? You don’t necessarily need to have ample square footage. Big or small, a wet bar has a lot of utility in a home – extra counter space, glassware storage, an additional sink, cocktail mixing station. Built-in shelving, vanity towers, medicine cabinets, niches – built-ins definitely take on a large role in a well-organized and timeless bathroom. Because bathrooms are often small, these options offer storage and style without sacrificing floor space. Custom cubbies or lockers help everyone keep their belongings organized and out of other areas of the home. Add a bench, and you have yourself the perfect “launch pad” to get your family out-the-door. This entry was posted in Tips and tagged Bar, Bathroom Storage, Bed Nook, Bookshelves, Built In Beds, Built-In Bar, Built-in Bookshelves, Built-In Cabinetry, Built-In Cabinets, Built-In Media Center, Built-Ins, Delafield Remodeler, Entertainment Center, Family Room, Home Improvement, Lake Country Remodeler, Library, Library Storage, Media Center, Milwaukee Remodeler, Office Storage, Reading Nook, Southeastern Wisconsin Remodeler, Vanity Tower, Waukesha Remodeler, Wet Bar, Window Nook, Window Seats, Wisconsin Remodeler on February 21, 2018 by amanda. Thank you to our team, clients, and industry partners for a wonderful 2016. Cheers to the new year! Note his stylish Bartelt onesie! This entry was posted in In the News, Tips and tagged 2016 Year in Photos, 2016 Year In Review, Awards, Barn, Barn Wood, Barnwood, Chrysalis Award, Contractor of the Year, CotY Award, Delafield Remodeler, Farmhouse Remodel, Food Drive, Home Improvement, Hunger Task Force Food Drive, Kitchen Remodel, Lake Country Remodeler, Milwaukee NARI, Milwaukee Remodeler, Modern Farmhouse, NARI, Office Remodel, Regional Chrysalis Award, Regional CotY Award, Remodel, Remodeling Tour, Southeastern Wisconsin Remodeler, Tour of Remodeled Homes, Waukesha Remodeler, Wisconsin Remodeler, Year in Photos, Year in Review on December 27, 2016 by amanda.